Reference number for this case: 23-aug-54-Vernon. Thank you for including this reference number in any correspondence with me regarding this case. EVREUX, August 24 (AFP). -- mysterious machines are said to have been seen by several people in the sky of Vernon (the Eure) during the night of Sunday to Monday. The son of a tradesman of the city claims that he has clearly seen, around one o'clock of the morning, above the Seine, a lengthened object, of red color, resembling a large cigar. According to his statements, this object hovered motionless at a rather low height. The silence was total. "It had the shape of a disc surmounted of a red dome with a very brilliant aureole surrounded of flames." The saucer was detached from the cigar, fell to the vertical, then appeared to want to follow a level flight above the bridge. It veered, went up and disappeared suddendly. It was replaced at once by another. This curious carrousel would have lasted three quarters of an hour. These observations were confirmed by several people and particularly by a chemical engineer of the ballistic and atomic [false, aerodynamic] research laboratory for the army, who followed, at the same hour, the RN 182 [false, 181]. The engineer observed the mysterious brilliant machines and judged, with the person who accompanied him, that these could only be flying saucers. The article underneath has been published in the national daily newspaper Libération, France, on wednesday, August 25, 1954, in the 6th and last page as a small insert at the bottom of the page. Evreux, August 24 - Mysterious machines have reportedly been seen by several people in the sky of Vernon during the night of Sunday to Monday. The son of a tradesman of the city says he has distinctly seen, at about one o'clock in the morning, above the river Seine, an elongated object, of red color, resembling a cigar. According to his statements, this object hovered motionless at a rather low altitude. The silence was complete. "It had the shape of an oval disc, of dark color, topped by a red dome with a very brilliant crown surrounded by flames." The saucer detached itself from the cigar, fell vertically, then appeared to have decided for a leveled flight above the bridge. It veered, went up and disappeared abruptly. It was replaced at once by another. This curious carrousel is said to have lasted three quarter of hour. These observations were confirmed by several people, and in particular by a chemical engineer of the ballistic and atomic research laboratory for the army, which was driving on national road 182 at the same time. [Ref. qh1:] JOURNAL "LE QUOTIDIEN DE LA HAUTE LOIRE:"
The following article appeared in the daily newspaper "Le Quotidien de la Haute Loire" on August 26, 1954. Mysterious crafts have allegedly been seen by several people in the sky of Vernon (Eure) during the night of Sunday to Monday. The son of a tradesman of the city says that he has distinctly seen, at about 01:00 hour of the morning, above the Seine, an elongated object of red color, resembling a large cigar. According to his statements, this object hovered at a rather low altitude. A flying saucer detached from this curious craft. These observations were confirmed by several people and particularly by a chemical engineer of the ballistic research laboratory of the army, which was driving on national road 182 [181?] at the same hour. 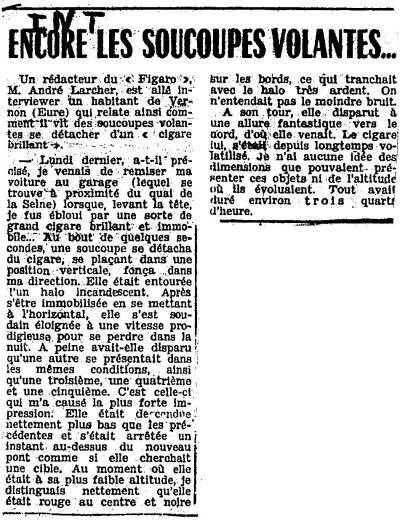 A journalist of "Le Figaro", Mr. André Larcher, went to interview a resident of Vernon (the Eure) whom thus reports how he saw flying saucers being detached from a "brilliant cigar". Last Monday, he specified, I had just garaged my car in the garage (which is near the quay of the Seine) when, raising the head, I was dazzled by a kind of large cigar shining and motionless... At the end of a few seconds, a saucer was detached from the cigar, being placed in a vertical position, sank in my direction. It was surrounded of an incandescent halation. After having immobilized itself while taking an horizontal position, it suddenly moved away at an extraordinary speed, to get lost in the night. Hardly had it disappeared, that another came under the same conditions, as well as a third, a fourth and a fifth. It is this one which caused me the strongest impression. It descended definitely lower than the preceding ones and had stopped one moment above the new bridge as if it sought a target. At the time when it was at its lower altitude, I clearly distinguished that it was red in the center and black on the edges, which sliced with the very burning halation. No noise at all was heard. In its turn, it disappeared at a fantastic pace towards the north from where it came. As for the cigar, it had disappeared long ago. I do not have any idea of the dimensions which these objects nor of the altitude where they had evolved. All had lasted approximately three quarters of an hour. It has been a long time since we last heard of flying saucers. In the night from Sunday to Monday, people are said to have seen mysterious machines. Among the observers, where a chemical engineer from the atomic and ballistic research who declares that they could only be flying saucers. In our issue for September 4, 1953, alone of all the Press, "Le Démocrate" announced the appearance of flying saucers in the sky of our town. Mr. Buch, policeman, his family, neighbors, and passer-by's in Saint-Marcel, were witnesses of the facts. One year, almost day for day, another of our fellow-citizens, Mr. J. M..., son of a tradesman of our city (he asked to keep anonymity to him), was the witness of similar facts in the night from Sunday to Monday. "Returning rather late from a travel, I had just parked my car close to the Bridge. It was approximately 1 hour of the morning. When closing again the door of the garage, I looked by chance in the direction of the Seine. The night was rather dark. I then saw very distinctly above the bridge a lengthened object of red color, resembling a large cigar, which hovered motionless at a rather low height and in uttermost total silence. Immediately, I saw a flying saucer to detach; which I can describe with precision. It had the shape of an oval disc, of dark color, surmounted by a red dome with a very shiny aureole, surrounded by flames. A flying saucer was detached from the cigar, fell to the vertical, then appeared to want to observe a level flight above the bridge; it veered, went up, and disappeared suddenly. It was replaced at once by another. The last one particularly impressed me, because I had the impression that it was going to land on the bridge, so much it lost altitude. But it set out again suddenly like the preceding ones at a terrifying speed, in the direction of the North." M. M..., qui avait déjà observé une soucoupe volante, mais en plein jour, il y a deux ans dans la région d'Evreux, a été le seul témoin (contrairement à ce qui a été dit), de cette incursion extraordinaire sur notre ville. Mr. M..., whom had already observed a flying saucer, but in broad daylight, two years ago in the area of Evreux, was the only witness (contrary to what was told), of this extraordinary incursion on our city. Beginnings of a terrifying science or not, will we have the key of the mystery some day? The autumn sky fills with fog and mystery! Mr. Henri Coanda, scientist of international reputation, who currently devotes to experiments on solar energy, in La Londe, village of the Provence, between Toulon and Lavandou, believes in the existence of the flying saucers. With a Marseilles journalist who came to interview him, he even specified that machines of this kind had been built and tested by the means of the radio control, writes our fellow-member "France-Soir". "These craft, he told the journalist, had animals as passengers. The first saucers brought them back dead but, thereafter, other animals returned alive." At the question: "Were you informed of experiments made with human passengers? ", Mr. Henri Coanda answered: "No, but some nations could succeed in putting pilots in these apparatuses. If it is not done yet, the thing will be realizable in one or two years." — Nothing is mysterious in the appearance of the flying saucers who do not come from any other planet but ours. It is quite simply lenticular aerodynes, scientific name of what you call the flying saucers. Take a 5 FR coin between the thumb and the big finger, put it at two or three centimetres above a piece of paper. If you blow on the coin, you will see the paper rise. Thus, if by some unspecified means one creates a rather powerful blow under a disc, the disc will rise and remain motionless in the airs. The draught thus moved goes on the right-hand side and on the left-hand side. Direct it it thanks to a suitable piping system (there are 180 pipes on my model of saucer), on the side of this disc, and prevent it to leave on this side. The saucer will move to a speed taht can reach 100O meters per second. For the moment, one did not exceed this prodigious speed which is about 3600 kilometer-hour. Let us add that Mr. Henri Coanda, scientist of Rumanian extraction, settledin France, is a specialist in the aeronautical questions. A "cigar" gives birth to several "saucers" above Vernon! — Last Monday, around one hour and half of the morning, I had just parked my car in the garage (which is near the quay of the Seine), when, looking up, I was dazzled by a kind of large shining and motionless cigar... After a few seconds, a saucer was detached from the cigar, was placed in a driving position, dove in my direction. It was surrounded by an incandescent halation. After having immobilized itself while putting itself at the horizontal, it suddenly moved away at an extraordinary speed to be lost in the night. Hardly had it disappeared that another showed under the same conditions, as well as a third, a fourth and a fifth. It is this last one that caused the strongest impression to me. It came definitely lower than the preceding ones and had stopped one moment above the new bridge as if it sought a target. At the time when it was at its lowest altitude, I clearly distinguished that it was red and black on the edges, this contrasted with the very fiery halation. Not the least noise was heard. In its turn, it disappeared at a fantastic pace towards the north, from where it came. The cigar had already disappeared long ago. I do not have any idea of the dimensions of these objects nor of the altitude at which they could have where maneuvered. All had lasted approximately three quarters of hour. We had reported the statement of two young Norwegian women claiming to have been disturbed, in the middle of bluberry picking, by the landing of a flying saucer piloted by an extremely courteous "Martian". The Norwegian newspaper "Attenposten" had announced that the American pilot Baily Faurot had confirmed, at the time of its passage in Oslo, to have met, in the area of Mosjoeen, the two people having mitaken his helicopter for a "flying saucer" and himself for an inhabitant of Mars. But the two Norwegian young people maintain their statement. And those all the more find credit as the U.S. helicopter pilot Baily Faurot denies having landed at the place where the girls were. "No helicopter," said on its side a senior police officer, after having examined the clearing, "could have landed there." A young engineer from Vernon saw five flying saucers. But these saucers - and this is the original side of the case - came out of a large luminous machine which had the shape of a cigar. The five saucers evolved during a few moments in the sky of Vernon. One of them approached the ground sufficiently close so that the engineer could distinguish the details of the machine. It was red in the center and black on the edges. Then cigars and saucers disappeared at a vertiginous speed in the direction of the North. The chronicle of the flying saucers gets richer of a new type: the relay-cigar. Mysterious machines are said to have been seen by several people in the sky of Vernon (the Eure) during the night of Sunday to Monday. The saucer was detached from the cigar, fell to the vertical, then appeared to want to follow a level flight above the bridge. It veered, went up and disappeared suddenly. It was replaced at once by another. These observations were confirmed by several people and particularly by a chemical engineer of the ballistic and atomic research laboratory for the army, who followed, at the same hour, the RN 182. The engineer observed the mysterious brilliant machines and judged, with the person who accompanied him, that these could only be flying saucers. The strange cigar shone in the night above the hills. When Bernard Miserey saw it at approximately one o'clock in the morning, a few days ago, in Vernon, he remained amazed about it. He had just put his car at the garage and had thrown a random glance towards the Seine which ran very close, at the end of the street. That's when he saw the thing. At the end of a moment, a vertical disc was detached from the from of the apparatus, which Bernard Miserey classified in the category of the flying saucers, and which seemed to comprise a dark red core, bordered of black and surrounded of a luminous halation. The saucer descended towards the Seine, always at the vertical, then it took the position of the North where it disappears in a snap. The cigar was still there. A little later, a second saucer was detached, then three others, which disappeared under the same conditions. Suddenly, Bernard Miserey became frightened. This is because a third saucer had been detached; which appeared to him to go down towards the bridge as for attacking it [it or him]. And then, it too, slipped by towards the north and disappeared. The cigar, meanwhile, had disappeared. All the scene had lasted approximately three quarters of an hour. 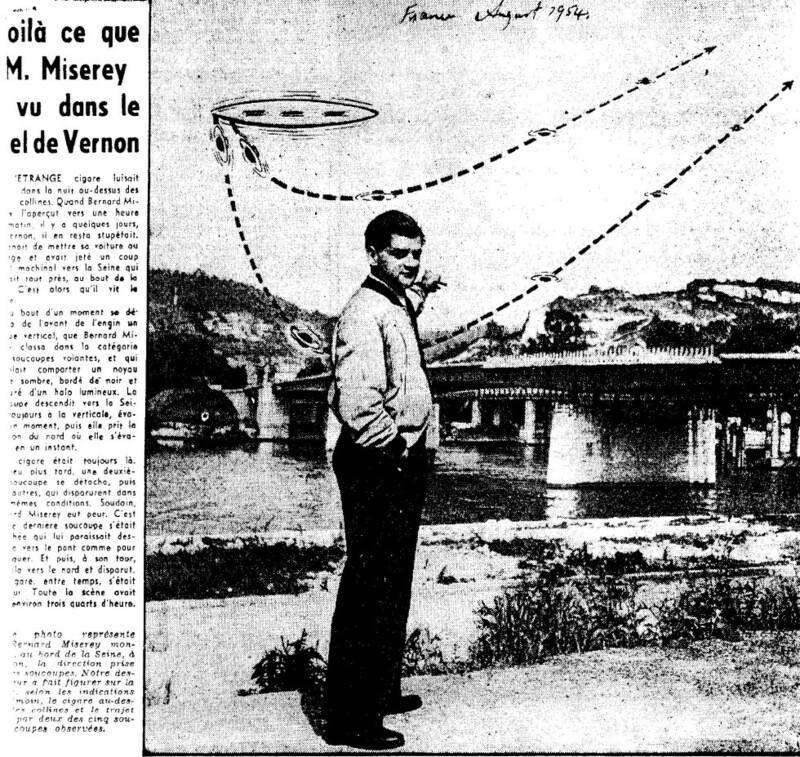 Our photograph represents Mr. Bernard Miserey showing, at the edge of the Seine, in Vernon, the direction taken by the saucers. Our draughtsman reproduced on the photograph, according to the indications of the witness, the cigar above the hills and the path followed by two of the five observed saucers. 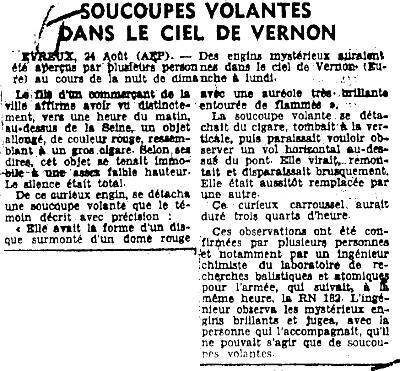 The newspaper talks of sightings in Europe in 1954 and says that Two policemen (gardiens de la paix) and a young chemical engineer, 25 years old, saw over Vernon, in Eure, during the night of August 26-27, "a huge cigar that shone motionless," Five saucers were successively detached from this "cigar." The last one came down lower than the others, and could be closely observed by the witnesses. It was red in the center, black around the edges, and it disappeared to the north at a dizzying speed. There had been only 73 "French saucers" from 1947 to December 31, 1953, but the number increased od about twenty in 1954. The most spectacular case was that of Vernon, with its cigar from where five discs were detached, one of which went down at low altitude above the new bridge, as if it sought a target. A 25-year-old man of Vernon, Eure Department, reported that during the night of August 22 1954, he had seen, motionless in the sky, a large, luminous, cigar-shaped object, from which a flying saucer detached itself, assumed a vertical position, descended a short distance, leveled off, and silently disappeared at great speed. He stated that this silent appearance and flight was repeated in turn by four other saucers. The fifth saucer descended farther than the others and was clearly red in the center and black along the edge. (by the time the last flight was completed), the cigar had long since "volatilized" (sic). The entire phenomenon lasted about 45 minutes. Two constables also reported having seen an elongated, luminous flying object during that night. The author indicates that on August 25, 1954, three people said they saw over the river Seine, near Evreux in the northwest of Paris, a flying saucer which, as a satellite, was linked to a huge cigar-shaped object. The author indicates "Daily Mail" as source. The author indicates that in the night from Sunday 22 to Monday 23 August 1954 around one a.m., in Vernon, France, Bernard Miserey had put his car at the garage and had automatically thrown a glance towards the Seine at the end of the street. He discovered with amazement in the sky above the hills a shining spindle-shaped motionless craft, perfectly visible and of big size. At the end of a few minutes a disc in vertical position seen by the section was detached from the front of the spacecraft. The disc had a dark core, it was bordered of black and was surrounded by a luminous halation. It had a dome which seemed reddish. This flying saucer moved away from the "cigar", went down still in vertical position towards the Seine, moved during a while then took a northern course and moved away at very high speed. A second and a third saucer were detached from the still motionless cigar and did the same operations as the first. Mr. Miserey was suddenly anxious during one moment. A last flying saucer came out of the "cigar" and plunged towards the bridge of the Seine like plane diving at near ground level to drop its bombs, but it only carried out an ascending curve above the bridge before leaving following the three others. At the time of these last operations the "cigar" had literally vanished. The operations had lasted approximately three quarters of an hour, and many people observed it, including a chemical engineer of the Laboratoire de Recherches Ballistiques et Atomiques of the Army who was at the same moment on the road RN 182, and who was convinced that they could only be flying saucers. 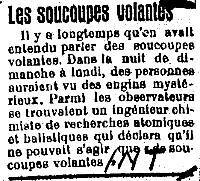 Jimmy Guieu indicates that newspapers and "scientists" had screamed it was an hallucination and mirage whereas people had made the observation independently, and that these saucers did not have anything in common with weather balloons or meteors. Finally, on the night of the 22nd-23rd [August 1954], the sky over Vernon, not far from Paris, was the scene of a virtual merry-go-round which lasted 45 minutes. There is a ballistics study center at Vernon. The town is literally bulging with technicians. Several observed the fantastic maneuvers: a large mother Saucer surrounded by swarms of little Saucers which came and went. The events took place in the small town of Vernon, in the department of Eure, at 65 kilometers in the West-North-West of Paris. The small city is near a military ballistics and aerodynamics research center. The night between August 22 and 23 had a clear and limpid weather over the Paris area, with a clear sky and an excellent visibility. The Moon was at six days of its conjunction and diffused only a weak luminosity at the end of the night. Around one hour in the morning, Mr. Bernard Miserey, a tradesman of Vernon, returns at his home and puts his car in the garage of his residence, on the Southern bank of the Seine river. While coming out of the garage, he is stunned by the a pale light that bathes the city which was still in the darkness before he entered the garage. When looking up towards the sky, he discovers an immense motionless and quiet luminous mass resembling a gigantic vertical cigar apparently stationary in the sky above the Northern bank of the Seine, at a distance which he estimated as approximately 300 meters. During the following day, Bernard Miserey went to the police and reports about the events (statement reproduced further in this file). At the police station, he learns that two policemen on patrol in the same night around one hour in the morning also observed the phenomenon, as well as an engineer from the army laboratories did, who saw the phenomenon while driving his car at the same time on national road RN 181 in the South-west of Vernon. According to Michel, the four statements of the four witnesses were recorded by the police bureau, the only being informed of the case until August 25, and they closed the investigation because of the absence of possible explanation. Michel notes that only Mr. Miserey made himself known, and that the engineer, when located by journalists, politely showed them to the door. The author indicates that in Vernon in the Eure at 1 o'clock in the morning on August 23, 1954, Bernard Miserey, tradesman, had put his car in the garage and was on southern bank of the Seine, when suddenly, opposite him, 300 meters away, above the northern bank, he saw a kind of gigantic vertical cigar which appeared to him to be one hundred meters long, an enormous mass, luminous, silent, motionless, suspended in the air. While he looked at he suddenly saw spouting out of the bottom of the cigar a horizontal disc which fell as in free fall, then stopped, rocked, passed above the river and became at the same time very luminous, then disappeared towards the south. A second, then a third and a fourth one did the same, finally, outgoing the bottom of the cigar, a fifth disc descended lower than the others, at near ground level of the bridge. It was immobilized while oscillating slightly, and Mr. Miserey distinguished very clearly "its circular form and its more intense red luminosity in the center, attenuated on the edges, and the burning halation which surrounded it." This last disc rocked like the others, but ceased appearing luminous and rushed to the north. It is only the next day that Mr. Miserey learned that two policemen of Vernon had also saw a strange phenomenon, it seems however that of from the place where they were, they saw only the cigar, not the maneuvers of the saucers. A military engineer, also witness, avoided all "publicity". The author indicates that Mr. Miserey remarkably described what he saw and, very important detail, the display lasted three quarters of an hour. He indicates as source the book by Aime Michel on page 26 and Le Figaro for August 27, 1954. "I have been contemplated this astonishing sight for a while, when suddenly, from the bottom of the cigar, a kind of object in the shape of an horizontal disc emerges, initially free-falling, then slows down, and suddenly rocked and sank horizontally through the river in my direction while becoming very luminous. During a very short time I could see this disc from the front. It was surrounded by a halation of a sharp luminosity." "A few minutes after it had disappeared behind me towards the south-west at an extraordinary speed, a second object similar to the first was detached in the same manner from the lower end of the cigar and operated in the same way. A third object followed, then a fourth. In an interval a little longer, finally, a fifth disc was detached from the still motionless cigar. That one was dropped much lower than the previous ones, to the short-nap cloth of the new bridge where it was motionless one moment while oscillating slightly. I could then see its circular shape and its red, more intense luminosity in the center very clearly, dimmed on the edges, and the burning halation which surrounded it. After having hovered a few seconds, it rocked like the first four objects and also started to dart like an arrow, but towards the North, where it lost itself in the distance while gaining height." "During this time, the luminosity of the cigar had disappeared, and the gigantic object, which was perhaps a hundred meters long, had melted itself in the darkness. The display had lasted three quarters of an hour approximately." Jacques Vallée describes the case by reproducing the report by Aimé Michel. Jacques Vallée indicates that there was an observation on August 23, 1954, in the little town of Vernon, 40 miles northwest of Paris, that has been recognized as the first landmark of importance in the wave. Vallée indicates that the witness is a Vernon businessman, Bernard Miserey, who had just put his car away when, coming out of the garage, he saw a pale light illuminating the town, which had been in complete darkness a little while before, with a completely clear night and the moon at its last quarter and rising about that time. Vallée indicates that Mr. Miserey looked at the sky and saw a huge, silent, motionless, luminous mass, apparently suspended above the bank of the river some 300 meters away, that Mr Miserey compared to a gigantic cigar standing on end. "I had been watching this amazing spectacle for a couple of minutes, when suddenly from the bottom of the cigar came an object like a horizontal disk, which dropped at first in free fall, then slowed, and suddenly swayed and dove horizontally across the river toward me, becoming very luminous. For a very short time I could see the disk full-face; it was surrounded by a halo of brilliant light." "A few minutes after it had disappeared behind me, going southwest at a prodigious speed, a similar object came from the cigar and went through the same maneuvers. A third object came, then a fourth. There was then a long interval, and finally a fifth disk detached itself from the cigar, which was still motionless. This last disk dropped much lower than the earlier ones, to the level of the new bridge, where it remained still for an instant, swaying slightly. At that time I could see very clearly its circular form and its red luminosity - more intense at the center, fading out at the edges - and the glowing halo surrounding it. After a few seconds pause, it wobbled like the first four, and took off like a flash toward the north, where it was lost in the distance as it gained altitude. During this time the luminosity of the cigar had faded, and the gigantic object, which may have been three hundred feet long, had sunk into darkness. The spectacle had lasted about three-quarters of an hour." Jacques Vallée adds that Mr. Miserey was not aware that there were corroborating witnesses, two policemen making their rounds at 01:00 a.m. who had also observed the phenomenon, as well as an army engineer southwest of the town. Vallée indicates that the case was described briefly by a Paris newspaper, Libération, for August 25, 1954, and that with the exception of an investigation conducted by Aimé Michel, no further study was made of the case. "I then realized that a pale gleam lit the city, which was very dark a few moments earlier. Looking up, I discovered a kind of gigantic vertical, motionless and quiet cigar, apparently stationed above the northern bank of the river, at an altitude of approximately 300 m."
"I contemplated this astonishing spectacle since one moment when suddenly, from the bottom of the cigar, a sort of object in the shape of an horizontal disc emerges, which initially fell in free fall, then slows down, and suddenly rocked and sank horizontally through the river in my direction while becoming very luminous. During a very short time I was able to see this disc from its face. It was surrounded by a halation of a sharp luminosity." "A few minutes after it had disappeared behind me towards the south-west at an extraordinary speed, a second object similar to the first was detached like it from the lower end of the cigar and operated in the same way. A third object succeeded it, then a fourth. There was then a little longer interval, and finally a fifth disc was detached from the still motionless cigar. This one was dropped much lower than the previous ones, to the short-nap cloth of the new bridge where it was still one moment while slightly oscillating. I could then see very clearly its circular shape and its red, more intense luminosity in the center, attenuated on the edges, and the burning halation which surrounded it. After a few seconds of immobility, it rocked like the four first did and also darted off fast as an arrow, but towards the north, where it was lost in the distance by taking altitude. During this time, the luminosity of the cigar had disappeared, and the gigantic object, which was perhaps 100 meters long, had faded in the darkness. The sighting had lasted three quarters of hour approximately." "I then realized that a pale gleam lit the city, very dark a few moments earlier. Looking up, I discovered a kind of gigantic vertical, motionless and silent cigar, apparently hovering above northern bank of the river, at 300 m of altitude approximately." "I was contemplating this astonishing display since one moment when suddenly, from the bottom of the cigar, a kind of object in the shape of an horizontal disc emerged, which initially fell in free fall, then slowed down, and suddenly rocked and rushed horizontally across the river in my direction while becoming very luminous. During a very short time I was able to see this disc from its front. It was surrounded by a halation of a sharp luminosity." "A few minutes after it had disappeared behind me towards the south-west at an extraordinary speed, a second object similar to the first was detached the same way from the lower end of the cigar and operated in the same way. A third object did the same, then a fourth. There was then an interval a little longer, and finally a fifth disc was detached from the still motionless cigar. This one dropped much lower than the previous ones, at near ground level of the new bridge where it was immobilized one moment while oscillating slightly. I then managed to see very clearly its circular form and its red, more intense luminosity in the center, dimmed on the edges, and the burning halation which surrounded it. After a few seconds of immobility, it rocked like the four first and also started out vers fast, but towards the north, where it was lost in the distance while taking altitude. During this time, the luminosity of the cigar had disappeared, and the gigantic object, which was perhaps 100 meters long, melted in the darkness. The display had lasted three quarters of hour approximately." The author indicates that this statement was recorded at the police station of Vernon, in the Eure, and corroborated by three others, that of an engineer of the laboratories of the army passing on the RN 191, and that of two agents making a round. He indicates that this observation of saucers leaving their "mothership" took place in the night from the 22nd to 23rd of August 1954 towards 1 o'clock when Mr. Miserey was leaving his garage after having garaged his car and that he had the feeling that there was something in the atmosphere. 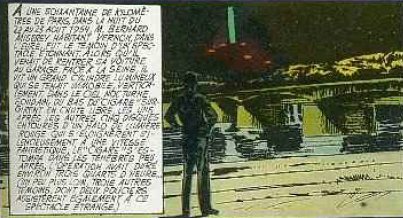 Jean Giraud indicates that the "cloud cigar" is one of the most interesting elements of the "flying saucers" phenomenon and that it was observed inter alia in Vernon on August 23, 1954. The two ufologists and authors indicate that on August 23, 1954 at one o'clock in Vernon, Bernard Miserey and several other people among them a chemical engineer of the ballistic and atomic research laboratory of the army observed "a lengthened object of red color, motionless, at low height, from where a dark colored disc surmounted of a dome was detached." They indicate as source the newspaper "Le Courrier de l'Ouest" for August 25, 1954. The authors indicate that in the night from the 22 to 23 of August 1954 in Vernon in the Eure, in France, at about 01:00 a.m., Mr. Miserey was returning home by car and initially saw in the sky a lengthened object, vertical and strongly luminous. A small disc was detached and fell in free fall while the lengthened object was inclined and became horizontal. Then a second, then a third, a fourth and finally a fifth disc were detached, the last one going down lower than the others and becoming motionless while oscillating. Then the lengthened object seemed to be diluted in the night and disappeared. "The observation which was also seen by policemen" lasted approximately 45 minutes, and the authors comment on that the scene inevitably evokes the idea of a mothership sending observation satellites for more precise missions. They wonder, "but up to what point does it correspond to reality? It is impossible to tell." The authors indicates that the sources are in particular "Les Phénomènes Insolites de l'Espace" by Jacques Vallée, page 224, and "Alerte dans le Ciel" by Charles Garreau, page 186. While returning at his home, the witness observed a gigantic vertical cigar. At the bottom of the cigar five discs of red luminosity surrounded by a luminous halation came out. The discs left towards the North at an extraordinary speed. The French wave really got a good start, however, with the important Vernon "cigar." "...I feel reasonably certain that some stimulus existed in France -- whether political, scientific, extra-terrestrial, meteorological, or psychological -- that in the space of two months generated several hundreds of reports, reports which show a definite thread of pattern. "So, with this preamble, let us travel to France, in the late summer, 1954. The curtain apparently went up on this fantastic show on August 23, at 1:00 a.m., 40 miles north-west of Paris. A businessman had just put his car away, and as he came out of the garage he was surprised to see a pale light illuminating the town which had been in complete dark ness a little while before. The night was completely clear and the moon was at last quarter, and hence was rising at about that time. "Looking at the sky, he saw a huge, silent, motionless luminous mass, apparently suspended above the north bank of the river some 300 yards away. 'It looked,1 he said, 'like a gigantic cigar standing on end. I had been watching this amazing spectacle for a couple of minutes when suddenly from the bottom of the cigar came an object like a horizontal disk, which dropped at first in free fall, then slowed, and suddenly swayed and dived horizontally across the river toward me, becoming very luminous. For a very short time I could see the disk full-face; it was surrounded by a halo of brilliant light. "A few minutes after it had disappeared behind him, going southwest at prodigious speed, a similar object came from the cigar and went trough the same maneuvers. A third object, and then a fourth -- and finally a fifth detached itself from the cigar which was still motionless. This last disk dropped lower than the earlier ones, to the ' level of the new bridge, where it remained still for an instant, sway ing slightly. At that time he could see very clearly its circular form and its red luminosity --more intense at the center, fading out at the edges --and the glowing halo surrounding it. After a few second's pause, it wobbled like the first four, and took off like a flash toward the north, where it was lost in the distance as it gain ed altitude. During this time the luminosity of the cigar had faded, and the gigantic object, which may have been 300 feet long, had sunk into darkness. The spectacle had lasted about 3/4 of an hour. "Unbeknown to him, this observer reportedly had witnesses. Two policemen making their rounds at 10:00 a.m. also observed the phenomenon, as had an army engineer southwest of the town of Vernon. "The case was briefly described in the Paris newspaper Liberation. Nothing more was done about it..." 196. 196. UFOs 1960. "A written version of a talk presented by J. Allen Hynek to the Hypervelocity Impact Conference Banquet at Elgin Air Force Base, April 27, 1960." Air Force BLUE BOOK Files. Reel #89. According to a story in the London, England, Daily Mail, northwest of Paris, at a town named Evreux, three people spotted what they said was a "huge cigar-like object" that had a "flying saucer" linked to it in a satellite-like fashion. 206. 206. Wilkins, Harold T. Flying Saucers Uncensored. p.132. The author indicates that in the night from the 22nd to 23rd of August 1954 in Vernon, the Eure, an engineer of the army, two police officers and a tradesman saw 300 meters above the city a motionless cigar, silent, greenish, vertical, during 45 minutes. From its lower end came out a disc to very red luminous halation which darted towards the Seine and disappeared in the Southwest, four others followed and moved away "at a fantastic speed", the cigar grew blurred within 300 meters above Vernon. The source is noted "Otahi, 1973". Observation in Vernon (the Eure) in the night from the 22 to 23 of August 1954 by Mr Miserey around one hour of the morning a gigantic cigar of at least 100 meters length stations in vertical position at 300 meters of altitude. Very luminous discs of reddish color leave one after the others the bottom of the cigar and evolve very close of the witness at the height of the bridge. the observation lasted three quarters of an hour. The first known cloud-cigar report of the wave occurred in the early morning hours of August 23 at the town of Vernon (Eure Department), 40 miles west-northwest of Paris. Just before 1:00 a.m., businessman Bernard Miserey arrived home and put his car away. As he came out of the garage on the south bank of the Seine, he was surprised to see a pale light illuminating the town, which had previously been in complete darkness. Looking at the sky, he saw a huge, silent, motionless, luminous mass, apparently suspended above the north bank of the river some 300 yards away. It was shaped like a large cigar standing on end. Stated Miserey, "I had been watching this amazing spectacle for a couple of minutes, when suddenly from the bottom of the cigar came an object like a horizontal disk, which dropped at first in free fall, then slowed, and suddenly swayed and dove horizontally across the river toward me, becoming very luminous. For a very short time I could see the disk full-face; it was surrounded by a halo of brilliant light. A few minutes after it had disappeared behind me, going southwest at prodigious speed, a similar object came from the cigar and went through the same maneuvers. A third object came and then a fourth. There was then a longer interval and finally a fifth disk detached itself from the cigar, which was still motionless. This disk dropped much lower than the earlier ones, to the level of the new bridge, where it remained still for an instant, swaying slightly. At that time I could see very clearly its circular form and its red luminosity, more intense at the center, fading out at the edges—and the glowing halo surrounding it. After a few seconds pause, it wobbled like the first four, and took off like a flash toward the north where it was lost in the distance as it gained altitude. During this time the luminosity of the cigar had faded, and the gigantic object, which may have been 300 feet long, had sunk into darkness. The spectacle had lasted about three-fourths of an hour. When Miserey described his observation the next day, the police informed him that two policemen on duty at about 1:00 a.m. had also observed the phenomenon, as had an army chemical engineer driving along Route N-181 southwest of Vernon. The case is also briefly described in the Paris newspaper Libération of August 25. Luc Chastan indicates that in the Eure in Vernon on August 23, 1954 at 01:00 hours "The witness discovered a gigantic vertical cigar, motionless and silent, apparently stationed above the northern bank of the river at 300 m of altitude approximately. The witness contemplates this astonishing spectacle since one moment when suddenly, from the bottom of the cigar, a kind of object in the shape of horizontal disc emerges which initially fell in free fall, then slows down and sudden rocked and dove horizontally through the river in his direction and became very luminous. During a very short time he could see the front of this disc. It was surrounded by a halation of sharp luminosity. A few minutes after it had disappeared behind the witness towards the southwest at an extraordinary speed, a second object similar to the first was detached like it from the lower end of the cigar and operated in the same way. A third succeeded to it, then a fourth. There was then an interval a little longer and finally a fifth disc was detached from the still motionless cigar. The latter was dropped much lower than the previous ones at near ground level from the new bridge where it was immobilized while oscillating slightly. The witness could then see very clearly its circular form and its red, more intense luminosity in the center, attenuated on the edges and the burning halation which surrounded it. After a few seconds of immobility it rocked like the four first and also started very fast, but towards north where it was lost in the distance by taking altitude. During this time the luminosity of the cigar had disappeared and the gigantic object which might have been 100 m long had been lost in darkness. The display had lasted three quarters of an hour approximately. The witness informed the police station about it the next day morning, he was answered that two officers, during their round around one hour of the morning, had seen the same phenomenon. A military engineer, on the RN 181, is said to have seen it too." The sources are noted as "CASAR by Gatti Francis ** http://perso.wanadoo.fr/casar" and "Le livre noir des Soucoupes volantes by Durrant Henri ** Laffont 1970" and "Chroniques des apparitions E.T. by Vallée Jacques ** DENOEL 1972 - J'AI L coll.". "In a discussion on a Internet forum in 2004 (see Aleph files), the zetetician skeptic Eric Maillot (CNEGU) indicates that the witness surely mistook the moon for an extraterrestrial machine. At his request, this hypothesis was checked in 2006 by Thierry Rocher (CNEGU) who went on site and noted, according to a photograph of the time, the azimuth of the UFO as being between 50 and 60°N. As Eric Maillot predicted it, the moon was thus located well where the witness saw his UFO (the moon was 60°N and 5° on the horizon). The moon that the witness did not see close the his UFO. One will retain from this case that the moon can give place to complex and apparently resistant ufologic mistakes, in particular with cases known as of "dropping of girl-saucers" coming from a "cigar mothership"." "This azimuth is between 50 and 60° what matches perfectly with the position and the angular height of the moon at the date of observation. In short Aime Michel was wrong, and [X] also, like others." "X" indicates another ufologist whose Eric Maillot says "did not do anything to check." The website indicates that on 22 August 1954 at night in Vernon, France, "One object was observed." The sources are noted as Poher, Claude, Etudes Statistiques Portant sur 1000 Temoignag, Author, undated; Hall, Richard H., UFO Reports from the Files of the CIA, Fund for UFO Research, Washington. The website indicates that on 23 August 1954 at 01:00 in Vernon, France, "Giant cigar standing on end, emitted disc, dropped in free fall, slowed, swayed. Disk surrounded by red halo. Emitted four more discs." And: "Cigar-shaped objects were observed. Multiple independent witnesses. Six luminous cigar-shaped objects, about 300 feet across, were observed in clear weather by four male experienced witnesses on a river for 45 minutes (Miserey). No sound was heard." The sources are noted as Guieu, Jimmy, Flying Saucers Come from Another World, Citadel, New York, 1956; Aerial Phenomena Research Organization, APRO Bulletin, APRO, Tucson; Michel, Aime, Flying Saucers and the Straight-Line Mystery, S. G. Phillips, New York, 1958; Poher, Claude, Etudes Statistiques Portant sur 1000 Temoignag, Author, undated; Vallee, Jacques, Challenge to Science: The UFO Enigma, Henry Regnery, Chicago, 1966; Vallee, Jacques, Preliminary Catalog (N = 500), (in JVallee01); Vallee, Jacques, Anatomy of a Phenomenon, Henry Regnery, Chicago, 1965; Schoenherr, Luis, Computerized Catalog (N = 3173); National Investigations Committee Aerial Phenomena, NICAP investigation files; Binder, Otto, What We Really Know About Flying Saucers, Fawcett T1863, Greenwich, 1967; Hall, Richard H., The UFO Evidence, NICAP, Washington, 1964; Olsen, Thomas M., The Reference for Outstanding UFO Sighting Reports, UFOIRC, Riderwood, 1966; Haines, Richard F., Project Delta: A Study of Multiple UFO, L.D.A. Press, Los Altos, 1994, ISBN:0-9618082-4-1; Hatch, Larry, *U* computer database, Author, Redwood City, 2002; Smith, Willy, UNICAT computer database. The website indicates that on August 23, 1954 in the night on the N182, near Eure, France, several objects were observed by "one male witness (Ing)." This database recorded the same case 19 times instead of one. "This notion has the indisputable merit to gather several miracles worthy to interest at the same time the astronomers (the Moon seen towards the North) and the psychiatrists (telepathic lie). Come on." In a discussion on an Internet forum in 2004, French skeptic Eric Maillot indicates that the witness must have mistaken the moon for an extraterrestrial spaceship. In another Internet discussion forum, circa 2003-2004, French skeptic Dominique Caudron indicated that the witness Bernard Miserey already reported saucers earlier; this is confirmed by the article of "Le Démocrate Vernonnais." While Aimé Michel and others considered that the sighting has multiple independent witnesses, including the chemical engineer and another person as mentioned in several newspaper articles of the time, I am not so convinced of that, since the location of these other witnesses is not specified (driving on national road 182) and the nature of the sighting not really specified. These other witnesses may have seen something unrelated to Mr. Miserey's sighting. The altitude of the place at the level of the river Seine is 350 meters above sea level. [-] indicates that I do not have a copy of the original yet. [---] AFP (Agence France Presse) news release, France, August 25, 1954. 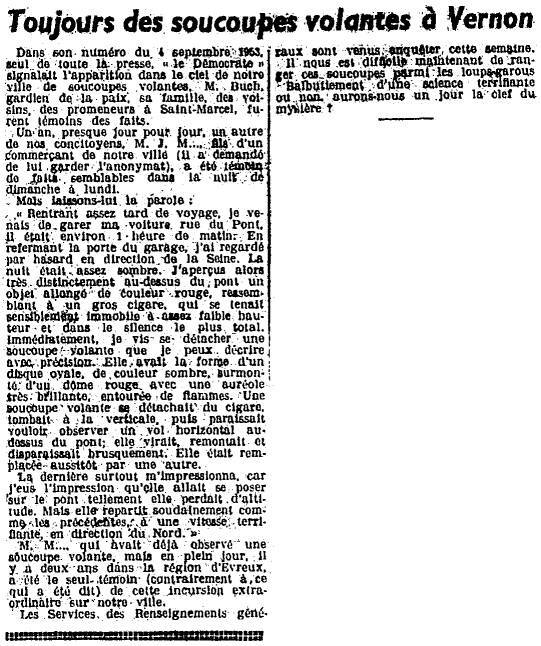 [mp1] Article in the newspaper Maroc-Presse, Casablanca, Morocco, August 25, 1954. [---] Article in the regional newspaper Le Courrier de l'Ouest, France, August 25, 1954. [li1] Article in the national newspaper Libération, Paris, France, August 25, 1954. [qh1] Article in the regional newspaper Le Quotidien de la Haute Loire, France, August 26, 1954. [---] Article in the national newspaper Le Figaro, Paris, France, August 27, 1954. [ce1] Article in the regional newspaper Centre-Eclair, Vernon, France, August 27, 1954. [lb1] Article in the local newspaper Le Baugeois, Bauge, France, August 27, 1954. [dv1] Article in the local newspaper Le Démocrate Vernonnais, Vernon, France, August 27, 1954. [lp1] Article in the regional newspaper Le Provençal, France, page 9, August 28, 1954. [fa1] Article in the foreign newspaper Feuille d'Avis, Neuchatel, Switzerland, August 30, 1954. 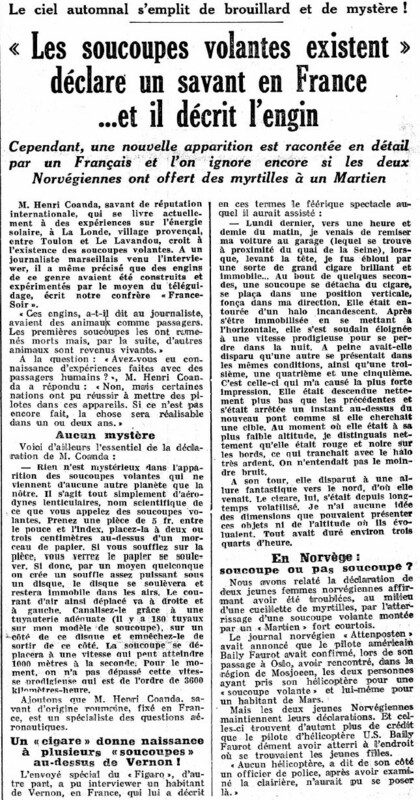 [eo1] Article in the regional newspaper L'Echo de l'Ouest, Nantes, France, September 4, 1954. [fd1] Article in the national weekly newspaper in France-Dimanche, Paris, France, September 5, 1954. [---] Article in the newspaper Daily Mail, London, U-K., 1954. [tg1] Article in the newspaper La Tribune de Genève, Genève, Switzerland, September 14, 1954. [pm1] Article in Paris Match magazine, France, #287, October 2, 1954. 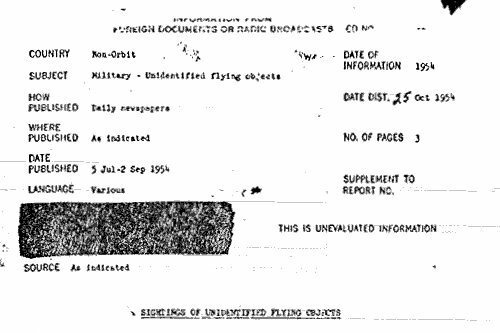 [ci1] "Information from foreign documents or Radio Broadcast - Sightings of Unidentified Flying Objects, 31 July - 20 September 1954", report by the CIA (Central Intelligence Agency, USA), Report N. 00-W-29903, pages 1,3, October 15, 1954. [hw1] "Flying Saucers Uncensored", book by Harold T. Wilkins, Pyramid Books publishers, USA, page 134, 1954. [jg1] "Black-Out Sur Les Soucoupes Volantes", book by Jimmy Guieu, Fleuve Noir éditeur, France, 1956. [am4] Article by Aimé Michel, in the ufology bulletin The Saucerian Bulletin, Gray Barker editor, USA, Volume 1, No 3, page 2, September 15, 1956. [---] "Alerte Dans le Ciel! Documents Officiels sur les Objets Volants Non Identifiés", book by Charles Garreau, Grand Damier publisher, France, page 186, 1956. [mc1] "Les Apparitions de Martiens", book by "Michel Carrouges" (pseudonym of Louis Couturier), Fayard publisher, France, pages 222,237, 1963. [---] Ufology bulletin APRO Bulletin, Aerial Phenomena Research Organization (APRO), USA. [jv2] "Anatomy of a Phenomenon", book by Jacques Vallee, Henry Regnery publisher, USA, 1965. [jv2] "Anatomy of a Phenomenon", book by Jacques Vallee, Neville Spearman publishers, U-K., 1966. [---] Sciences Year, USA, page 376, 1966. [---] "The Reference for Outstanding UFO Sighting Reports", book by Thomas M. Olsen, UFOIRC, USA, 1966. [jv1] "Les Phénomènes Insolites de l'Espace", book by Jacques Vallée, Editions de la Table Ronde, France, page 224, 1966. [---] "Le Livre Noir des Soucoupes Volantes", book by "Henri Durrant", Laffont éditeur, France, 1970. [cg1] "Soucoupes Volantes, 25 ans d'Enquêtes", book by Charles Garreau, Mame publisher, pp 34-35, 1971. [jg1] "Black-Out Sur Les Soucoupes Volantes", book by Jimmy Guieu, Omnium Littéraire éditeur, France, pp 85-86, 1972. [gi1] "Le Dossier des Soucoupes Volantes", comic book by Lob and Gigi, Dargaud publisher, France, 1972. [hd1] "Les Dossiers des OVNIS", book by Henri Durrant, Robert Laffont publisher, France, pp 37-38, 1973. [---] Article by R. Otahi, in the ufology magazine Lumières Dans La Nuit (LDLN), France, 1973. [---] Aesculape, illustrated monthly magazine, by the Société internationale d'histoire de la médecine, France, page 41, 1973. [jv2] "Anatomy of a Phenomenon", book by Jacques Vallee, Tandem publishers, U-K., pp 66-67, 1974. [am1] "Mystérieux Objets Célestes", book by Aimé Michel, Seghers publisher, France, pp 29-31, 1977. [jv1] "Les Phénomènes Insolites de l'Espace", book by Jacques Vallée, Robert Laffont éditeur, France, page 201, 1978. [cc1] "Ephémérides des Années d'Espoir de l'Ufologie - 4", article by Gilbert Cornu and Henri Chaloupek, in the ufology magazine Lumières Dans la Nuit (LDLN), #253-254, pp 39-40, July-August 1985. [rc1] "Palmarès des Observations dans l'Eure", compiled by Robert Crépin, regional delegate for LDLN, in the ufology magazine "Lumières dans la Nuit" #259-260, page 38, January - February 1986. [lg2] "UFOs: A History - 1954 June-August", monography by Loren Gross, USA, page 93, 1990. [---] "UNICAT Computer Database", compiled by Willy Smith, USA. [---] "Project Delta: A Study of Multiple UFO", book by Richard Haines, L.D.A. Press publishers, USA, 1994. [---] "UFO Reports from the Files of the CIA", par Richard Hall, Fund for UFO Research, USA. [jc1] "Epistémologie du Phénomène Ovnien ou Cinquante Ans de Déni Scientifique", book by Jacques Costagliola, L'Harmattan publisher, France, page 155, 1998. [fg1] Case file by Francis Gatti, France, circa 2002, on the Internet. [ht1] "Satellite Objects and Cloud Cigars", article by Herbert S. Taylor, International UFO Reporter (IUR), Volume 29, Number 1, spring 2004. [---] "1954: l'Orchestre s'Accorde", article by Bernard Miserey and Franck Buleux, in La Gazette Fortéenne, France, #4, 2006. [em1] eMail to me by Eric Maillot, December 6, 2006. 0.1 Patrick Gross February 2, 2007 First published. 1.0 Patrick Gross March 5, 2010 Conversion from HTML to XHTML Strict. First formal version. Additions [lc1], [ud1], [ud2], [ud3]. 1.1 Patrick Gross March 12, 2010 Addition [jg1], [gi1]. 1.3 Patrick Gross June 26, 2010 Additions [tg1], [mc1], [hd1]. 1.4 Patrick Gross November 5, 2016 Additions [am4], [ub1], [lg2]. 1.5 Patrick Gross November 23, 2016 Additions [er1], [lg1]. 1.5 Patrick Gross December 7, 2016 Addition [gi1]. 1.6 Patrick Gross December 9, 2016 Additions [fa1], [pm1]. This page was last updated on December 9, 2016.